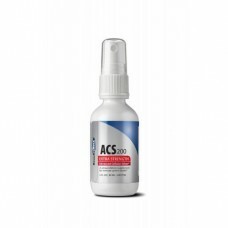 Replacing the original formula, ACS 200? Extra Strength has greatly improved killing power without compromising safety. ACS 200? Extra Strength achieves 99.9999% (complete) kill against Borrelia burgdorferi, Candida albicans and MRSA as proven via independently derived in vitro, kill-time studies. Powered by the same patented silver technology as STERIPLEX? Ultra, now EPA-approved to kill anthrax spores. ?I am absolutely thrilled with the results I personally received while using ACS 200? Extra Strength. It relieved my heart valve infection within 2 days when nothing else had.? ACS 200? Extra Strength has been proven extremely safe in independent acute oral toxicity studies. The leading silver-based supplement in multiple independent studies, ACS 200? Extra Strength rapidly kills an enormous array of pathogenic microorganisms; literally oxidizing the cell wall of Gram-positive and Gram-negative bacteria, as well as killing naked virus, fungi and all without damaging human tissue. When choosing an immune system support formula, safety and efficacy are the only two factors that truly matter. ACS 200? Extra Strength provides fast and significant relief patients can feel, without harming the gut flora. Far beyond ?colloidal silvers? in performance, ACS 200? Extra Strength provides 200 parts per million of uniquely energized silver molecules, which are suspended in ?wetter water?? ; a proprietary micronutrient transport medium that is 43% lower in surface tension, enabling rapid penetration through all biological systems. No single immune support product will provide a more effective treatment or prophylaxis protocol than ACS 200? Extra Strength, proven to be the most powerful, broad-spectrum antimicrobial available to physicians today. ACS 200? Extra Strength is significantly more effective in killing pathogens than competing brands.